He also likes to tell me about his double adam’s apple and cooking eggs on the engine of his Dodge Durango. But I digress. Mustache guy has a point: there are very few things that create the benchmarks between regular old ‘hanging out’ and full on ‘summer entertaining’ – a cooler full of bagged ice and cold drinks is numero uno. I mean, it just feels festive. It doesn’t matter if you’re entertaining 100 people, or it’s just you and the cat – if there’s a cooler with drinks, it’s a party. Oh, snap. This one below feels very summery, but it’s a year rounder. Best part is that it’s easy to make, inexpensive, kid-friendly, and your peeps are going to be so impressed at the results. Zero artistic skills required. If you love color and messy fingers, you are going to love this project! This is the first of many projects you will be seeing from me where you will find all the materials at your local Michael’s store. 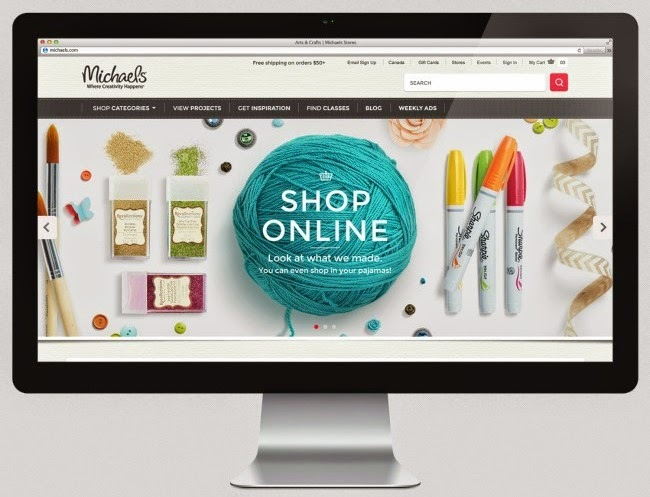 I am proud to tell everyone that I recently joined Michael’s craft stores as one of their Makers (woot woot!). This is an exciting opportunity for me and I hope you will join myself and the other Makers in the adventure ahead. I have been shopping at Michael’s craft stores since Jesus wore short pants, so this is like coming home for me. The idea that they want to partner with me because they want to reach out to YOU GUYS makes me smile. Gosh, they have great taste in audience, don’t they? Okay. Back to the bucket! 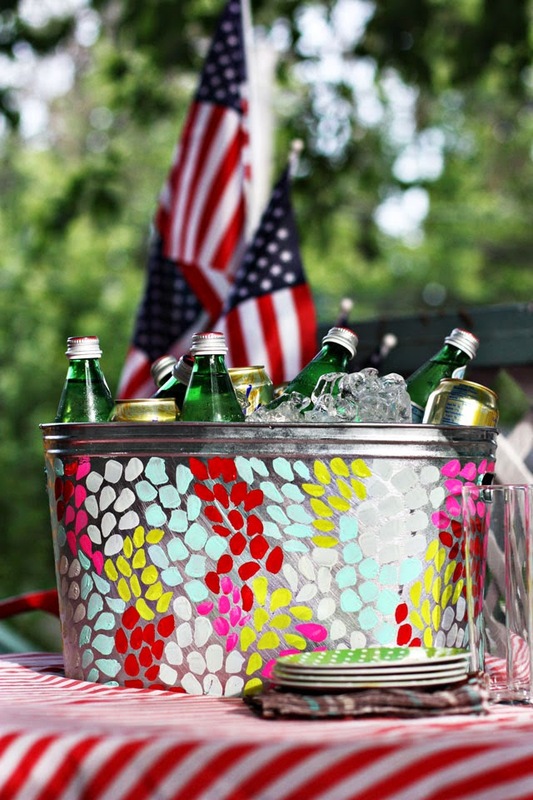 This party bucket was inspired by this painted tub, one of the many projects you will fine on Michael’s website. This one uses a different technique for getting the paint to work, but you get the idea. Metal safe paint + sandpaper + bucket = awesome. 1. 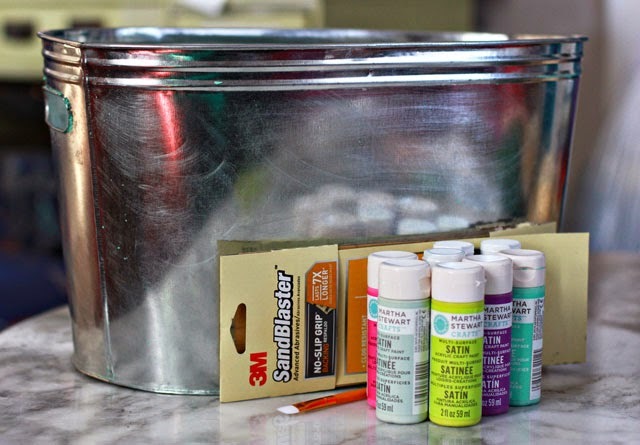 Prep your aluminum bucket by sanding it thoroughly. The paint will not stick if you don’t rough up the surface properly, so really take a few minutes to rub it thoroughly. Move in circles to leave a sub-texture. Or not. Your call…. 2. 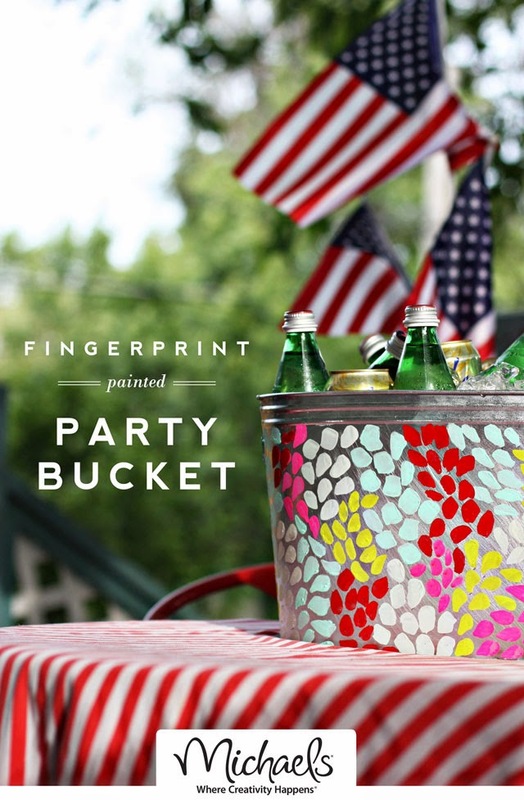 After squirting some paint onto a disposable plate, dip one finger in the paint and daub it on the bucket. Daub it. Like a finger print — just one single move then BOOP, it’s there. Go back for more paint and make another boop right next to it. Some will be bigger, some will be smaller. Some will be pointy, some will be curvy. Embrace it! For this project, I worked in clusters of 11 boops at a time. After one cluster went down, I laid down another 11 boops right next to it. And another, and another. Eventually the surface will cover and you’ll have to fill the gaps with more or less than 11 boops, but that’s cool. Keeping most of the clusters consistent in volume helps create a pattern that will look very purposeful. Even if you are not comfortable with painting or basic principles of composition — it’s going to look great. Be sure to let your paint cure for 48 hours before you stock it full of ice. If you don’t, the sides of the tub will build up condensation and that could mess with your paint. I experimented with this a bit, so trust me…just give it a good 48 hours and then you’ll be set to party. When you are done painting your bucket and find extra paint on your palette, don’t throw it away! Use that paint to swipe doodle over a box or blank envelope. Michael’s sells blank white gift bags in quantity – you could make a whole closet full of these. Collapsible boxes are great because you can hoard them all year and then you’ll be stocked for Christmas. Those skinny boxes in the middle are perfect for giving away cookies – they are actually aluminum foil boxes that I store up under the sink. Do I sound like a hoarder? Yeah. You got me. But I got you come Christmas! The party is on. You bring the bean dip, and text me when you are on the way. If I don’t see you there, have a great weekend! BTW, check out some of the other inspiring projects coming from other Michael’s Makers and their brand new blog, The Glue String. If you decide to pick up some items while you are over there, use the promo code 50MEMORIES for 50% off one regular priced item. Free shipping on orders over $50. Holy Jesus in Short Pants! Congratulations! I really need to spend more time in Michael’s….besides agonizing over colour choices in the yarn aisle and shelling out waaayy too much money on framing, that is. Tell me about it. The good news is their 60% off framing coupons are awesome — you just got to time it right. This is ADORABLE and just in time for Father’s Day! Seriously–I love it. Also, I should just go ahead & make a line item in my budget for Michael’s because they get a sizeable chunk of change from me on a regular basis! You have more creativity in that finger you used to daub paint than I have in my entire body. Congrats. I may not do this but it’s a fantastic idea and a great read. Deb, something tells me you have creativity coming out of your earlobes! 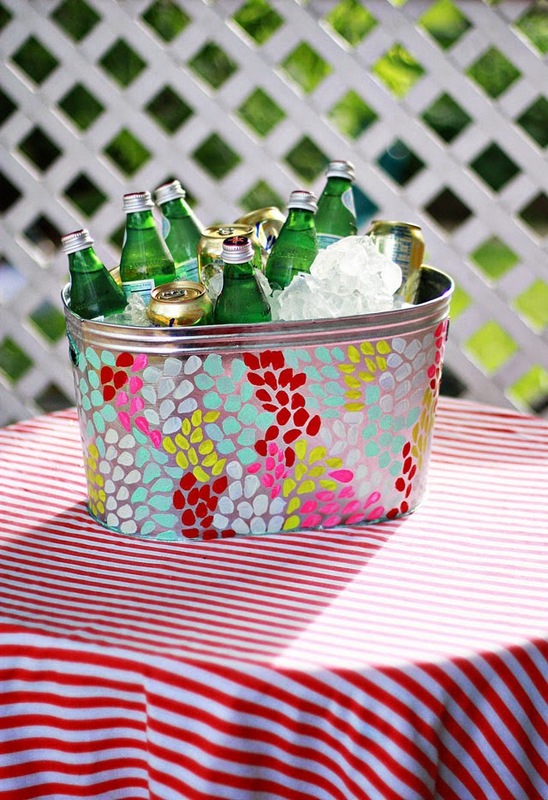 Party buckets might not be for all of us, but they are fun, no? 🙂 I just like saying it…party bucket. party. bucket. Freaking beautiful! Congratulations for real on a perfect partnership, my Peaches! Michaels?! That is so cool. I can’t wait to tell my daughter. We are there all the time but we’ll be there more often if it means they are working with you Peaches! How exciting! And this bucket is da bomb! I’ll be there more often too — see you there, Sonja! Ahh, the Power of Boops, heretofore unknown in this artist’s lingo. Geez, I’ve just been smooshing and dotting all this time. I’m whipping up some bean dip and then we can boop together, k? Stopping by from Summer Fun List linky party. This looked like scrapebook paper until I read that it was finger prints. Beautiful! Pinning! Does anything happen to the paint if the bucket sweats? Like if it was wet and someone was carrying it around, would the paint come off at all? Is there any way to seal it so it doesn’t chip off or anything like that too?